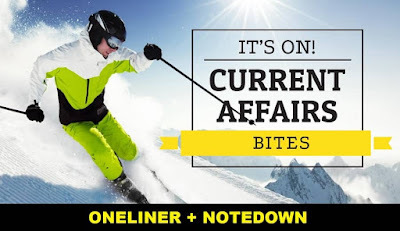 Achieversrule team has brought to you the Latest set of Current Affairs as one liners in our One Liner GK Current Affairs: 12th March 2018. These are very easy to remember and go through as all the details are mentioned in single sentences. Aspirants should take a note of the Static GK Note Down points provided at the end of the article as these are important for the upcoming examinations of Bank like IBPS PO, IBPS CLERK, SSC CGL, SSC CHSL and Railway exams. Also it will help boost your knowledge. You may also like Daily Current Affairs Updates and practice the Daily Current Affairs Quiz regularly for better result. The Union Housing Ministry has launched an association 'I-Metros' of all-India metro rail companies which will act as a forum of exchange of ideas and innovations. Milk production in the country increased by 20 per cent from 137.7 million tonnes to 165.4 million tonnes between 2014 and 2017, Minister of Agriculture and Farmers' Welfare Radha Mohan Singh. The Institute of Bioresources and Sustainable Laboratory (IBSD) has set up a floating laboratory in Loktak to constantly monitor its water quality. The first-ever multi-nation naval exercise at sea, MILES-18, began at the Andaman sea. India’s first national coastal policing academy, National Academy of Coastal Policing (NACP) to train police forces in effectively safeguarding countries will start. The National Crime Records Bureau (NCRB) celebrated its 33rd Inception Day on March 11, 2018. Russia successfully launched high-precision aeroballistic Kinzhal hypersonic missile from a MiG-31 supersonic interceptor jet. The Asian Development Bank (ADB) and the International Solar Alliance (ISA) signed a cooperation arrangement to promote solar energy deployment in Asia and the Pacific. The first Indo-French Knowledge Summit for university, scientific and technology cooperation was successfully held in New Delhi. Prime Minister Narendra Modi and French President Emmanuel Macron have inaugurated Uttar Pradesh's biggest solar power plant in Mirzapur district Chhanvey block. India B won 45th edition of the Deodhar Trophy 2018 by defeating Karnataka in final match at the Himachal Pradesh Cricket Association Stadium in Dharamsala. India won the "Best Exhibitor Award " at ITB – Berlin.